Do you love jazz? We certainly do. For us, it’s about the music. We have a stellar magazine you want to see. You can learn about some great artists, read about the owners of some of the greatest venues here in Detroit, and best of all, you can share your opinion about what you read with your friends and family right at the bottom of every article. The Smooth Jazz Hub is a place where Smooth Jazz fans, artists and the industry can meet, talk and share everything Smooth Jazz-related! Take a look around the site to find news, reviews, interviews, CDs, blogs, forums, festivals, gear, services and so much more! For more information visit the website http://www.smoothjazzhub.com/ or their facebook-page. Houston, Texas — THE JAZZ IN M.E.E. magazine is set to officially launch January 2013. THE JAZZ IN M.E.E. is an affiliate of Multifaceted Exquisite Events Inc. Newsand Media division. THE JAZZ IN M.E.E., based in Houston, hosts and reports on jazz, literary and art events nationally. THE JAZZ IN M.E.E. is the newest addition to the M.E.E. network, targeting devotees to jazz and the arts. This online magazine will include dynamic cover stories, trendy Jazz Watch music reviews, boldly stylish CD releases, trend setting blog updates, enchantingly cool featured festival insights, informative “Inside M.E.E.” reports and other consequential jazz information. 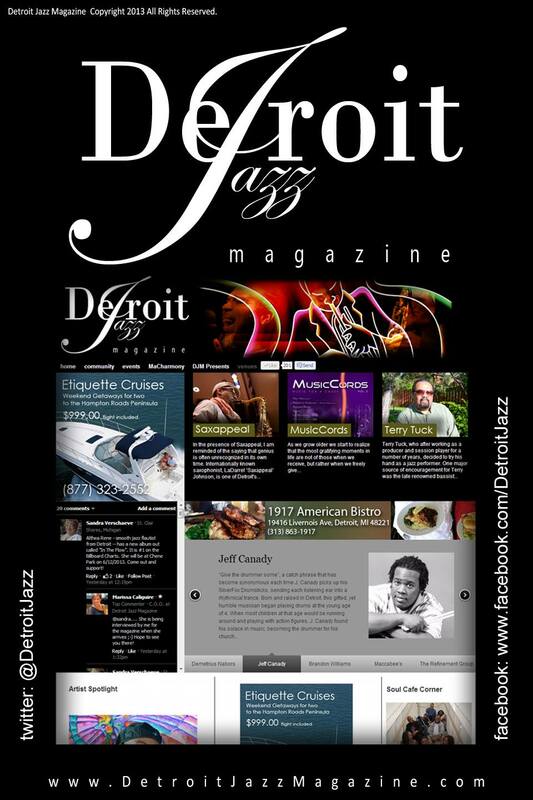 The magazine was developed after the success of In the Jazzy Limelight, an online article profiling various jazz artists. In the Jazzy Limelight has reached over 180,000 readers in 25 countries, with highest international views in Japan, Canada, Russia, Ukraine, France, and the United Kingdom. Readers of the online feature have a passion for jazz vacations, explorations and getaways. These topics will continue to be explored and expanded upon with the launch of THE JAZZ IN M.E.E. THE JAZZ IN M.E.E. was created to be a platform to showcase, support, advocate, market and promote the love of jazz, the artists, musicians, enthusiasts and supporters of this magnificent genre of music and the events that are a springboard for its success. M.E.E. is on a mission to keep jazz and its artists in the forefront. THE JAZZ IN M.E.E. aims to be an informative, inspiring and entertaining jazz style of living magazine where readers can find in-depth feature articles and columns pertaining to everything jazz with an artistic flair. The JAZZ IN M.E.E. is the creation of jazz advocate Melody Warren, Publisher/Editor-in-Chief. Warren describes her passion for jazz, “My love affair with jazz started years ago! I have fallen madly in love with the art form, the artists, the musicians, and those who support this genre of music. Jazz fits perfectly into my creative and artistic disposition, which is in close proximity to fashion and the arts. These three facets of beauty have always played an integral part of my life. So falling head over heels for the true American art form of jazz was totally understandable”. The M.E.E. network includes Multifaceted Exquisite Events Inc, THE JAZZ IN M.E.E., THE MELODY IN M.E.E. and GLAM. With positive feedback after the release of In the Jazzy Limelightlast year, Warren is now set to launch THE JAZZ IN M.E.E. magazine in January to connect jazz enthusiasts to the artists, music, products and services offered by jazz and the arts. The blog Cool Grooves – Smooth Jazz News offers some smooth jazz features. Smooth jazz is alive and well. It has merely transitioned to a new home – the internet and satellite radio, both comfortable formats for this demographic base. Not only has it found a new home, but a plethora of new music has been created in the genre. Great musicians who can stir the soul with instrumental music continue to increase the output of new smooth jazz music. Thankfully it has veered far off the trajectory of silly instrumental cover songs. It is blossoming into a great catalogue of original groove, funk and fusion. And this blog is here to keep you posted as to what’s new in Smooth jazz. So put the top down on the sports car, hook up the Ipod and let’s groove, chill and enjoy! More information about this website is available at coolgrooves.net. Smooth Jazz Network is part of Broadcast Architecture. Broadcast Architecture, founded in 1988, provides research and consultation services to the radio, television, and entertainment industries. Their sole commitment is to deliver the highest quality intelligence available and to utilize that intelligence to maximize the success of our clients. By combining innovation and experience with revolutionary technology, Broadcast Architecture has established a new hallmark of uncompromising service and effectiveness. Smooth Jazz Network offers Smooth Jazz Internet Radio and Smooth Jazz News at their website. This is probably the last resort for smooth jazz fans to discuss about their music outside of Facebook. If you want to join the discussion or if you have anything to say, visit this forum. SmoothJazzTimes Web Magazine™ offers up close and personal interviews with recording artists from the world of Smooth Jazz. We feature local jazz bands that have a major impact on the jazz scene from coast to coast. The latest in jazz news, reviews, concerts and events are offered here – in addition to segments surrounding the importance of music education and fine works from musically influenced illustrators. We also honor legendary jazz greats who paved the way for so many musicians today. SmoothJazzTimes Web Magazine was founded and created by Kim Betton, a veteran television news anchor/reporter who worked in various markets throughout her career covering both entertainment and breaking news reports from the field, and at the helm of the anchor desk. Some of Betton’s previous stations include, NBC 4 & MSNBC, Washington, DC, USA TODAY Sky Radio, Washington, DC, FOX 13 News, Memphis, TN, WKBW-TV, Buffalo, New York, and KARK 4 News in Little Rock, AR. SmoothJazzTimes Web Magazine is a product of Premier Multimedia Group, LLC, a Maryland/Washington, DC area based firm offering entertainment marketing and public relations, Web design, video production, voice imaging, photography and online publishing. You can visit this web magazine here.